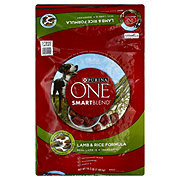 Give your dog the nutrition he needs while satisfying his true instincts when you serve Purina ONE SmartBlend True Instinct With a Natural Blend Of Real Turkey & Venison adult dry dog food. 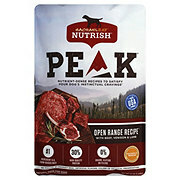 This natural pet food plus vitamins and minerals features a blend of real turkey and venison and other high-quality ingredients to provide the protein active adult dogs need and the nutrient-dense nutrition dogs crave. Crunchy kibble and double the meaty morsels compared to our Purina ONE Lamb & Rice formula help to make mealtime even more enjoyable, and the highly-digestible formula lets more nutrition go to work inside your dog. Recommended Daily Feeding Amounts: Weight of Dog: 3-12 lbs; 1.4-5.4 kg; = to 1-14 cups amount to feed. Weight of Dog: 13-20 lbs; 5.9-9.1 kg; 1-1/4 to 1-2/3 cups amount to feed. Weight of Dog: 21-35 lbs; 9.5-15.9 kg; 1-2/3 to 2-1/2 cups amount to feed. Weight of Dog; 36-50 lbs: 16.3-22.7 kg; 2-1/2 to 3-1/8 cups amount to feed. Weight of Dog: 51-75 lbs; 23.1-34.0 kg; 3-1/8 to 4 cups amount to feed. Weight of Dog: Over 100 lbs; Over 45.4 kg; 5 cups plus 1/3 cup for each 10 lbs (4.5 kg) of body weight over 100 lbs (45.4 kg). Adult Dog Feeding: The recommended feeding amounts indicated are based upon the average nutritional needs of an adult dog with a normal activity level (using a standard 8 oz/250 ml measuring cup which contains approximately 92 g of Purina One). Factors, such as a dog's metabolism, breed size, activity level, age and whether the dog is spayed or neutered, will affect the amount of Purina One needed to maintain an ideal body condition. The pet experts at Purina have provided the feeding amounts indicated as a starting point. If you find that your dog is losing weight or becomes overweight when fed these amounts, please adjust accordingly. To help your dog maintain an ideal body condition, monitor your dog's weight on a regular basis, making sure that his ribs are easily felt and his waist is visible when viewed from above. Maintaining an ideal body condition can impact your dog's lifetime health. 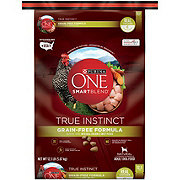 It's Not for All Dogs: Purina One True Instinct formula is specifically formulated for adult dogs. 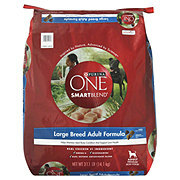 If you have a puppy, or a pregnant or nursing dog, feed Purina One SmartBlend Healthy Puppy Formula. May be Served Dry or Moistened: Purina One may be fed dry or mixed with water. If mixed, we suggest one part liquid to four parts Purina One. 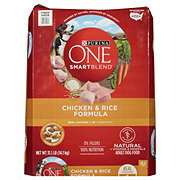 Making the Switch to Purina One: Although you'll be anxious to see the difference Purina One can make in your dog, please allow 7-10 days to ease the transition from your dog's current food. Each day, simply feed a little less of the previous food and a little more Purina One until you're feeding Purina One exclusively. This gradual transition will help avoid dietary upsets. 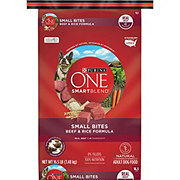 No Supplements Necessary: Purina One provides 100% complete and balanced nutrition for adult dogs. There is no need to add vitamins, minerals or other supplements, unless specifically directed by a veterinarian. Fresh Water, Proper Diet & Veterinarian Care: Be sure to provide fresh water in a clean container for your dog daily. Proper diet, exercise and veterinary care are the best ways to keep your dog healthy. If your dog hasn't had a check-up in the past year, please make an appointment today. Store in a cool, dry place. Ingredients Turkey (Source of Glucosamine), Corn Gluten Meal, Soy Flour, Beef Fat Naturally Preserved with Mixed-Tocopherols, Chicken Meal (Source of Glucosamine), Whole Grain Wheat, Whole Grain Corn, Soy Flakes, Rice Flour, Corn Germ Meal, Glycerin, Venison, Oat Meal, Liver Flavor, Calcium Carbonate, Mono and Dicalcium Phosphate, Salt, Caramel Color, Vitamins [Vitamin E Supplement, Niacin (Vitamin B-3), Pyridoxine Hydrochloride (Vitamin B-6), Folic Acid (Vitamin B-9), Menadione Sodium Bisulfite Complex (Vitamin K), Vitamin D-3 Supplement, Biotin (Vitamin B-7)], Potassium Chloride, Minerals [Zinc Sulfate, Manganese Sulfate, Copper Sulfate, Calcium Iodate, Sodium Selenite], Sulfur, Choline, Chloride. Crude Protein: Min. (30.0%), Crude Fat: Min. (17.0%), Crude Fiber: Max. (3.0%), Moisture: Max. (12.0%), Linoleic Acid: Min. (1.6%), Calcium (CA): (Min). (1.0%), Phosphorus (P): Min. (0.8%), Zinc(Zn): Min. (150 mg/kg), Selenium (Se): Min. (0.35 mg/kg), Vitamin A: Min. (15,000 IU/kg), Vitamin E: Min. 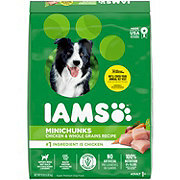 (460 IU/kg), Glucosamine (Not recognized as an essential nutrient by the AAFCO dog food nutrient profiles): Min. (350 ppm), Omega-6 Fatty Acids (Not recognized as an essential nutrient by the AAFCO dog food nutrient profiles): Min. (1.7%).